I can’t lie to you, today’s recipe really isn’t that healthy at all. 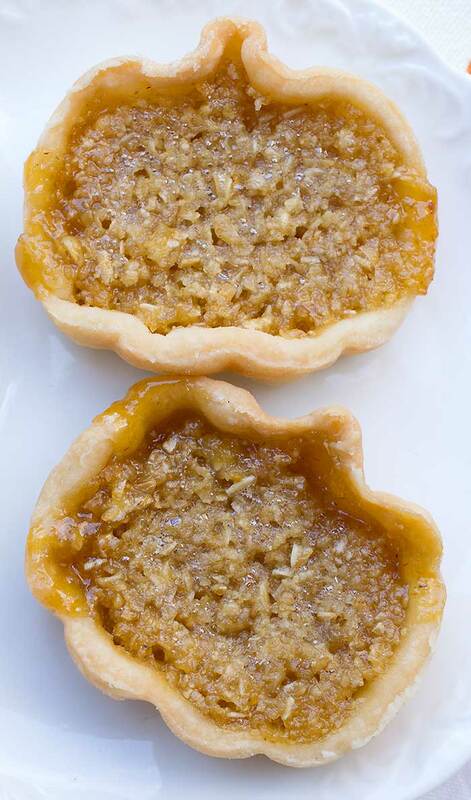 However, if you have non-vegans over these little Vegan Treacle Tarts will open their hearts to try other vegan goodies. If you are just here looking for a healthy fall dessert, I’d recommend trying a pecan pumpkin shake. In the shake can use the sweetener of your choice and it has no added oil. If you’re still here, I assuming that you add in a few naughty treats every once in awhile. The crust for the tarts are made with unbleached flour and vegan butter, though you can substitute whole wheat pastry flour and coconut oil if you’d prefer. I made these for my Harry Potter Halloween dinner and my friend made a vegan trecale tart ice cream to go with it! What the heck is golden syrup? It’s a sticky sweetener made with cane sugar that’s used mostly in UK recipes. You could try using a light agave nectar, but honestly, it’s the special golden syrup that makes this dessert so wonderful. I recommend trying to find it, even if you buy it online. I’m a huge Harry Potter fan, so I’m looking forward to the new Magical Beast movie, even if it doesn’t come out until next year. I also just had a Harry Potter dinner party where these delectable little tarts were featured as dessert. 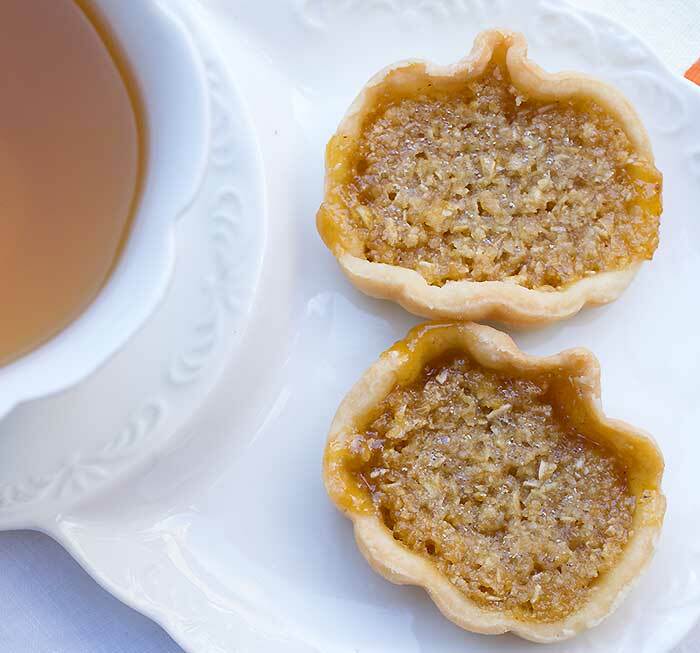 You have here treacle tarts mentioned all through the Harry Potter books, and they are even better than I expected. 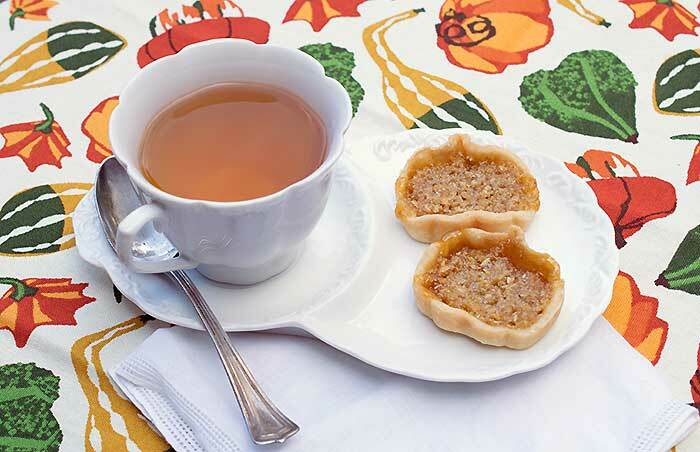 They are very sweet, in a pecan pie way, but the lemon really lifts them up and makes this seem fancier. I’ll keep making them mini-sized to help me not eat too much at one sitting! This is my version of a traditional English dessert. It usually has white breadcrumbs as part of the filling, but I used rolled oats minced in my food processor instead. It makes it a little healthier. Golden syrup can be found in the import section of a large grocery store, World Market, or online. Preheat your oven to 350 degrees and oil mini springform pans or line mini muffin tins with baking liners. Add the flour, sugar, and salt to a mixing bowl and mix well. Then add the vegan butter and cut in using 2 knives or a pastry cutter. Mix in 3 tablespoons of the water. If the dough isn't sticky enough to hold together add more water a tablespoon at a time until it is. Form a ball with the dough and refrigerate at least 30 minutes. Once cold, cut into quarters and leave all but the one you are working with in the fridge until you are ready to work with it. Roll one-quarter of the dough out on a floured cutting board, and use a glass or biscuit cutter to cut even shapes that are a fit for the mini-pans you are using. Press in prepared pans. Repeat until all dough is used. Lightly poke holes in the bottom of each crust and bake for 10 minutes without the filling. This will set up the crust for the second baking. Mix all the filling ingredients together well and set aside until the crusts are ready and cool to the touch. Once the crusts are cool, add a heaping tablespoon (more or less depending on the size of your pans) into each crust. Bake another 10 to 15 minutes, or until the filling is set. Rock your week with my cozy vegan menu plan. 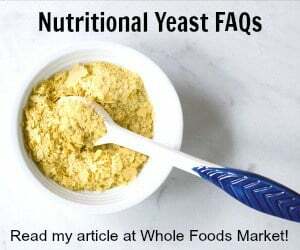 Do you think this will work with gluten free flour? I think so. You could sub your favorite gluten-free pie crust recipe too. It never occurred to me that other countries didn’t have golden syrup! It’s also delicious drizzled on pancakes. To my shame, I’ve never made a treacle tart but I’ll have to give it a go. Golden syrup substitute with maple syrup! I always thought treacle was molasses; I would have expected blackstrap molasses. Corn syrup is much too sweet for me BUT as these seem very like butter tarts … I could be convinced to try them with molasses. Aaah I love these! My kid is just getting into Harry Potter, and I can’t wait to start making themed treats with him. I love Harry Potter, too, and this looks like such a fun treat! I want to have a Halloween party just so I have an excuse to make then! That’s so fun that you had a Harry Potter dinner party. I’m not into that book/movie at all, but I like when people are all in on their interests. This dessert sounds wonderful!